Friday couldn't here quick enough, home girl needs some down time! I'm one of those people who get sick if they get too exhausted... this is one of those weeks. 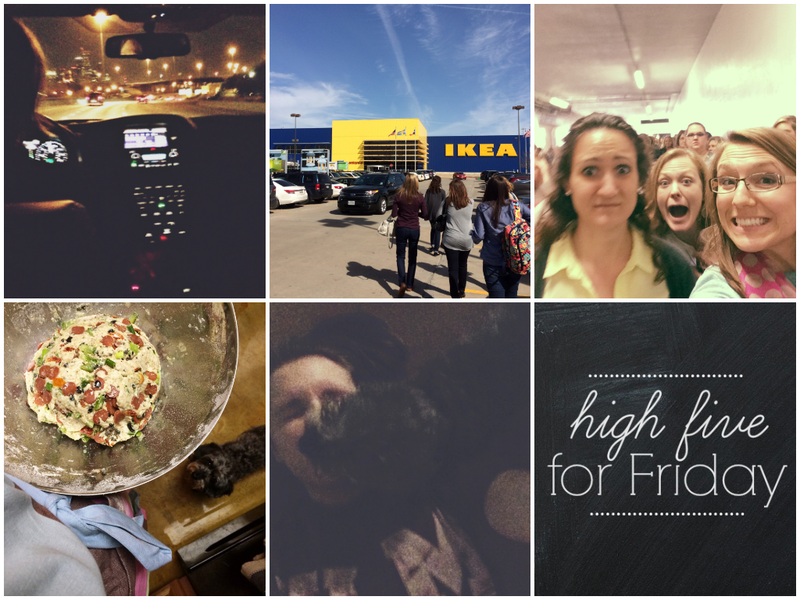 This week was crazy, but fun. Then again the last two weeks have been so busy they've been a blur. 1. We headed out last weekend to Women of Faith Houston. The company was good, and parts of the conference were enjoyable... but overall I wouldn't suggest it as a conference to attend. If you're looking for a women's conference stick to LifeWay, at least from my experience everything they promote is biblically sound. 2. While in Houston I finally got to hit up Ikea. I'll refrain from writing a whole post just about my love for that store. Let me just say this though, what I bought would have cost 3 times that at Target. I was shocked at how cheap it was. 3. We were laughing while heading out of the conference, it was like a sea of women. Or, considering the concrete ramps you are essentially forced down... slightly like cow herding. I felt like I was being pushed through to get shots and branded. 4. This Pizza Bread. If you haven't made it you're missing out. 5. Maddie was always the yoga dog, but I guess in her absence Ellie has taken up the slack. Tuesday when I was working out she practically mauled me trying to get attention. Wednesday she sat in front of me barking and growling. Then, when I was doing this rag doll movement the pup positioned herself so I had to sweep my hands across her in some cheap form of petting. This creature is just a hot mess, at least she didn't drink my coffee while I was doing yoga, which in some sick form of dog obedience training I'd considered her trained. As long as she knows not to touch momma's coffee we're good to go. So what are y'all doing for Mardi Gras?